The work of Dr. Florence Hawley, a 30s-era TVA dendrochronologist, gains new relevance as TVA and University of Tennessee scientists draw on her work to assess future weather impacts in the Tennessee Valley. It’s been a rainy winter following a year of record rain—one that’s had TVA’s River Forecast Center on its toes keeping up with all the water. Flood prevention is top of mind for almost everyone—except lead hydrologist Curt Jawdy. His mind is fixed on drought. 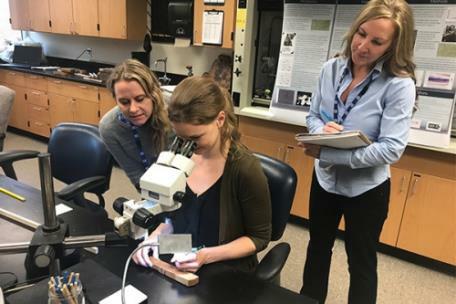 Mr. Jawdy is working with Laura G. Smith, a Ph.D. student in the Department of Geography at the University of Tennessee, to resurrect Dr. Hawley’s pioneering research from the 1930s. Dr. Hawley worked at TVA in its earliest days studying the relationship between rainfall and tree rings. Her goal was to better understand precipitation cycles in the Norris Basin. And they are looking to the rings to show them a record of the wild weather of the past—the good times and the bad. Beginning in 1934, Dr. Hawley spent two years in East Tennessee collecting hundreds of tree samples in an effort to look back in time further than had been thought possible. Some of her samples were from red cedars that date back to the 1300s. A student of A.E. Douglass of the University of Arizona, who is considered the father of modern dendrochronology, Dr. Hawley was uniquely suited to her work. Nevertheless, she faced sexism on the job, and was never allowed to publish the results of her red cedar study. She abandoned the work—and the samples—in the 1940s, but went on to have an influential career in the field of archaeology studying ceramics in the Southwest. To oversimplify a bit, wide rings correspond with years of ample precipitation; skinny rings with arid years. It’s a bit more complicated than that, especially here in the Valley where moisture from the forest floor must also be taken into consideration, but Ms. Smith is running the statistical analyses that will allow her to cut through the clutter. The historical samples are being updated with modern cedar tree samples taken from several locations in the Valley. TVA Natural Resources’ Suzanne Fisher and Heather Hart have helped Ms. Smith find and sample specimen trees at several TVA natural areas, including sites noted for their unique cedar barren characteristics. Their in-depth knowledge of the regional ecosystem has been a good bridge between dendrochronology and hydrology. Drought is particularly relevant now, when climate change is a topic of concern for many. And the way forward, Mr. Jawdy and Ms. Smith agree, is by first looking backward. The graph in the attached photos represents Valley precipitaion beween 1380 and 1990. 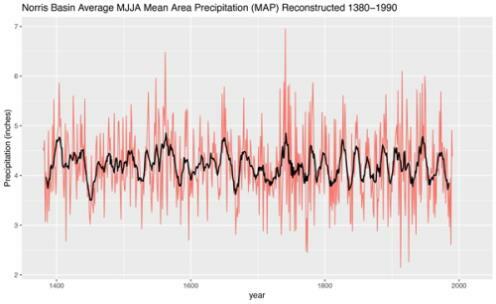 The red line shows actual rainfail, whereas the black line represents the ongoing seasonal average. 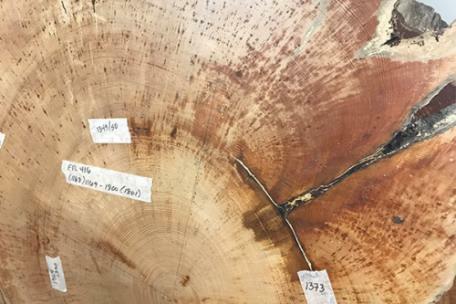 ‘The goal of the project is essentially to understand what the historic variability of the stream flow is using tree ring data to make better decisions in the future,” Ms. Smith says. When Smith’s work is complete, Mr. Jawdy will take the analysis and test it within TVA’s river management system to see how the system would react to different precipitation and runoff scenarios. “We want to take those hundreds of years’ worth of historical data, and run it through our river policy model, look at each intake on our system and see if at any time they would have been dry,” he said. The Valley has faced plenty of dry times—2007, for instance, was a year low on water. But even during the largest drought of record, no intakes within the TVA-managed system went dry. TVA works closely with the municipalities and industries that draw water from the river system to ensure their water supply stays reliable, mainly by instituting conservation measures when necessary. At this point, no results are in, though Ms. Smith is working to tell whether the Tennessee Valley was part of a drought experienced elsewhere on the Eastern Seaboard in the mid 1700s. Either way, the hard work of Dr. Hawley in the 1930s and of women scientists today will shine a brighter light on the future of the Tennessee Valley.